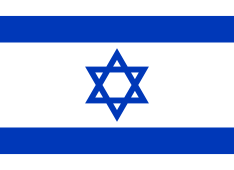 The flag of Israel (Hebrew: דגל ישראל‎ Degel Yisra'el; Arabic: علم إسرائيل‎ ʿAlam Israʼīl) was adopted on 28 October 1948, five months after the establishment of the State of Israel. It depicts a blue hexagram on a white background, between two horizontal blue stripes. The Israeli flag legislation states that the official measurements are 160 × 220 cm. Therefore, the official proportions are 8:11. Variants can be found at a wide range of proportions, with 2:3 being common. A blue Star of David between two horizontal blue stripes on a white field. Navy blue flag with a white vertically elongated oval set near the hoist containing a vertically elongated blue Star of David. Navy blue flag with a white triangle at hoist and blue Star of David in it. The blue colour is described as "dark sky-blue", and varies from flag to flag, ranging from a hue of pure blue, sometimes shaded almost as dark as navy blue, to hues about 75% toward pure cyan and shades as light as very light blue. The flag was designed for the Zionist Movement in 1891. The basic design recalls the Tallit (טַלִּית), the Jewish prayer shawl, which is white with black or blue stripes. The symbol in the center represents the Star of David (Magen David, מָגֵן דָּוִד), a Jewish symbol dating from late medieval Prague, which was adopted by the First Zionist Congress in 1897. In 2007, an Israeli flag measuring 660 m × 100 m (2,170 ft × 330 ft) and weighing 5.2 tonnes (5.7 short tons) was unfurled near the ancient Jewish fortress of Masada, breaking the world record for the largest flag. This record has since been surpassed several times. In the Bible, the Israelites are commanded to have one of the threads of their tassels (tzitzit) dyed with tekhelet; "so that they may look upon it, and remember all the commandments of the LORD, and do them (Num 15:39)." Tekhelet corresponds to the colour of the divine revelation (Midrash Numbers Rabbah xv.). Sometime near the end of the Talmudic era (500–600 CE) the industry that produced this dye collapsed. It became more rare; over time, the Jewish community lost the tradition of which species of shellfish produced this dye. Since Jews were then unable to fulfil this commandment, they have since left their tzitzit (tallit strings) white. However, in remembrance of the commandment to use the tekhelet dye, it became common for Jews to have blue or purple stripes woven into the cloth of their tallit. Und blau des Himmels Glänzen. The colours of his country. And blue, the shining of the firmament. In 1885, the agricultural village of Rishon LeZion used a blue and white flag designed by Israel Belkind and Fanny Abramovitch in a procession marking its third anniversary. In 1891, Michael Halperin, one of the founders of the agricultural village Nachalat Reuven flew a similar blue and white flag with a blue hexagram and the text "נס ציונה" (Nes Ziona, "a banner for Zion": a reference to Jeremiah 4:6, later adopted as the modern name of the city). A blue and white flag, with a Star of David and the Hebrew word "Maccabee", was used in 1891 by the Bnai Zion Educational Society. Jacob Baruch Askowith (1844–1908) and his son Charles Askowith designed the "flag of Judah," which was displayed on 24 July 1891, at the dedication of Zion Hall of the B'nai Zion Educational Society in Boston, Massachusetts. Based on the traditional tallit, or Jewish prayer shawl, that flag was white with narrow blue stripes near the edges and bore in the center the ancient six-pointed Shield of David with the word "Maccabee" painted in blue Hebrew letters. 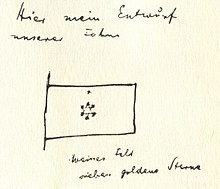 Herzl's proposed flag, as sketched in his diaries. Although he drew a Star of David, he did not describe it as such. In 1897, the First Zionist Congress was held in Basel, Switzerland, to consider re-establishing a homeland for Jews in Palestine. Morris Harris, a member of New York Hovevei Zion, used his awning shop to design a suitable banner and decorations for the reception, and his mother Lena Harris sewed the flag. The flag was made with two blue stripes and a large blue Star of David in the center, the colours blue and white chosen from the design of the tallit. The flag was ten feet by six feet—in the same proportions as the flag of the United States—and became known as the Flag of Zion. It was accepted as the official Zionist flag at the Second Zionist Congress held in Switzerland in 1898, and the State of Israel later adopted the design as the official flag, upon declaration of Israel as an independent state in 1948. A flag with blue and white stripes and a Magen David in the centre flew with those of other nationalities from one of the buildings at the Louisiana Purchase Exposition of 1904. It flew there in relation to large meetings of Zionists. That expo was the World's Fair hosting the 1904 Summer Olympics. However, many other nations have religiously exclusive symbols on their flags as well. For example, Muslim symbols are on the flags of Algeria, Turkey, and Pakistan among others, while Christian symbols are on the flags of the Nordic countries, Switzerland, and the United Kingdom. In addition, the Star of David (or Shield of David) was not historically an exclusively Jewish symbol. It was used as an architectural motif inconsistently in ancient synagogues, and it notably appears on the cover page of the Leningrad Codex. It became an important Jewish symbol in the early Middle Ages. In medieval times, this star was also an Islamic symbol known as the Seal of Solomon (Suleiman) and was also extremely popular among the Anatolian beyliks. States known to use the seal on their flags were the Karamanids and Jandarids. The seal was also used by Ottomans in their mosque decorations, coins and personal flags of pashas, including that of Hayreddin Barbarossa, as well as in Christian architecture such as the Basilica of Santa Croce, Florence. The Hasidim in particular were vociferous in their opposition to early Zionism and often protested against the Zionists. They even went as far as banning the Star of David, originally a religious symbol appearing only in the synagogue, which had now become "defiled" by the Zionists. Rabbi Moses Feinstein called the Israeli flag "a foolish and meaningless object" and discouraged its display in synagogues. The Chazon Ish wrote that praying in a synagogue decorated with an Israeli flag should be avoided even if there was no other synagogue in the area. Former Sephardic Chief Rabbi of Israel, Ovadia Yosef, also forbade the flying of the Israeli flag in synagogues, calling it "a reminder of the acts of the evil-doers." Rabbi Joel Teitelbaum referred to the flag as the "flag of heresy" and viewed it as an object of idol worship. Ultra-Orthodox Jews in Israel never display the Israeli flag and there are some fringe groups who resort to burning it on the country's Independence Day. The Ponevezh Yeshiva famously flies the Israeli flag on Independence Day. A popular myth in the Muslim world is that the blue stripes on the Israeli flag actually represent the rivers Nile and Euphrates as the boundaries of Eretz Yisra'el, the land promised to the Jews by God according to the Bible. Those making this allegation insist that the flag "secretly" represents the desire of Jews to conquer all of the land between the Nile and Euphrates rivers, which would involve conquering and ruling over much of Egypt, all of Jordan and Lebanon, most of Syria, and part of Iraq. Yasser Arafat, Iran and Hamas also made the allegation, and repeatedly tied this notion to the stripes on the Israeli flag. Saqr Abu Fakhr, an Arab writer, has also spoken out against this idea. He writes that the "Nile to Euphrates" claim regarding the flag is one of seven popular misconceptions and/or myths about Jews which, despite being unfounded and having abundant evidence refuting them, continue to circulate in the Arab world. The "Ink Flag" of 1949, which was raised during the War of Independence near present-day Eilat. 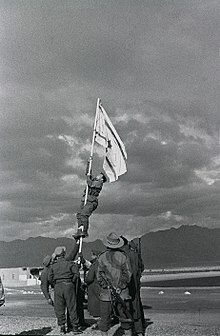 This homemade flag's raising on a pole by several Israeli soldiers was immortalized in a photograph that has been compared with the famous photograph of the United States Flag being raised atop Suribachi on the island of Iwo Jima in 1944. Like the latter photograph, the Ink Flag raising has also been reproduced as a memorial. The Israeli flag that stayed flying throughout the siege of Fort Budapest during the Yom Kippur War, which is currently preserved in the Israeli Armored Corps memorial at Latrun. Fort Budapest was the only strongpoint along the Bar-Lev Line to remain in Israeli hands during the war. The 2007 World Record Flag, which was unveiled at an airfield near the historic mountain fortress of Masada. The flag, manufactured in the Philippines, measured 660 by 100 meters (2,170 ft × 330 ft) and weighed 5.2 tonnes (5.7 short tons), breaking the previous record, measured and verified by representatives for the Guinness Book of Records. It was made by Filipino entrepreneur and Evangelical Christian Grace Galindez-Gupana as a religious token and diplomatic gesture of support for Israel. Modern reconstruction of the Ink Flag. ^ a b Israel Ministry of Foreign Affairs publication The Flag and the Emblem Archived 2007-04-17 at the Wayback Machine by art historian Alec Mishory, wherein he quotes "The Provisional Council of State Proclamation of the Flag of the State of Israel" made on October 28, 1948 by Joseph Sprinzak, Speaker. ^ Varied examples Archived 2006-07-09 at the Wayback Machine; Flag ~75% toward cyan from pure blue full article:The Flag and the Emblem Accessed July 28, 2006. ^ a b "Giant Israeli flag breaks world record for largest in world". Haaretz. Associated Press. 25 November 2007. Retrieved 2014-08-02. ^ Navon, Mois. "Historical Review of Tekhelet & the Hillazon" (PDF). Ptil Tekhelet Organization. Retrieved 2015-09-18. ^ Simmons, Rabbi Shraga. "Tallit stripes". Ask the Rabbi. About.com. Retrieved 3 April 2006. ^ Frankl, A. L. (1864). "Juda's Farben". Ahnenbilder (in German). Leipzig. pp. 127–8. ^ Bar-Am, Aviva (26 April 2002). "The first families". The Jerusalem Post. Archived from the original on 18 October 2016 – via Highbeam. ^ Reznikoff, Charles (May 1953). "From the American Scene: Boston's Jewish Community: Earlier Days". Commentary. Retrieved 3 November 2017. ^ Herzl, Theodor (1896). "Der Judenstaat. Versuch einer modernen Lösung der Judenfrage" (in German). Leipzig u. a. – via Deutsches Textarchiv. ^ Sholem, Gershom (September 1949). "The Curious History of the Six Pointed Star; How the 'Magen David' Became the Jewish Symbol". Commentary. pp. 243–251. Retrieved 19 November 2013. ^ "Milestones: 1945–1952". Office of the Historian, U.S. Department of State. ^ "Why the Tallit Barcode?". Chabad. Retrieved 13 November 2014. ^ "64 countries have religious symbols on their national flags". Pew Research Center. 25 November 2014. ^ "This Passover, Put a Turkish Spin on Your Seder Table". Tablet. Retrieved 13 November 2014. ^ "Tuscany's Jewish tourist attractions. An inspiring visit to Florence, Pisa and Livorno". Jerusalem Post. Archived from the original on 29 March 2015. Retrieved 13 November 2014. ^ Diaspora Nationalism and Jewish Identity in Habsburg Galicia. Cambridge University Press. 31 August 2012. pp. 172–173. ISBN 978-1-107-01424-4. Retrieved 9 May 2013. ^ Yakov M. Rabkin (2006). A threat from within: a century of Jewish opposition to Zionism. Fernwood Pub. p. 166. ISBN 978-1-55266-171-0. Retrieved 16 August 2011. ^ Yakov Rabkin. Judaism vs Zionism in the Holy Land, A Threat from Within: A Century of Jewish Opposition to Zionism, Fernwood/Zed Books, 2006. ^ Diaspora Nationalism and Jewish Identity in Habsburg Galicia. Cambridge University Press. 31 August 2012. pp. 172–173. ISBN 978-1-107-01424-4. Retrieved 9 May 2013. Perhaps, the most prominent Sephardic legal authority, Rabbi Ovadia Yosef of Jerusalem, upholds Rabbi Feinstein's verdict and, in his comment, specifies that "those who chose this flag as a symbol of the State were evil-doers." Emphasizing that removing the flag, "a vain and useless object," from the synagogue should be done in harmony and peace, he recommends "uprooting all related to the flag so that it should not constitute a reminder of the acts of the evil-doers." ^ Shimy Dvar HaShem. 22 August 2014. p. 44. ^ Meir Litvak (2006). "Haredim and Western Culture: A View from Both Sides of the Ocean". Middle Eastern Societies and the West: Accommodation Or Clash of Civilizations?. The Moshe Dayan Center. p. 287. ISBN 978-965-224-073-6. Note 31: This display of flags stands in sharp contrast with the negative attitude of Israeli Haredim toward the Israeli flag, which consequently is never displayed on Israeli Haredi homes or businesses. ^ "Haredis indifferent to flag on yeshiva". 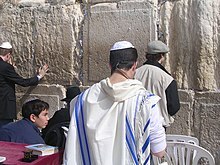 The Jerusalem Post | JPost.com. Retrieved 2018-10-29. ^ Genesis 15.18: "The Lord made a covenant with Abram, saying unto thy seed have I given this land from the river of Egypt unto the great river, the River Euphrates." ^ Rubin, Barry. The PLO between Anti-Zionism and Antisemitism, Background and Recent Developments Archived 2006-03-22 at the Wayback Machine, The Vidal Sassoon International Center for the Study of Antisemitism, The Hebrew University of Jerusalem, 1993. Accessed April 3, 2006. Wikimedia Commons has media related to Flags of Israel.